Watching clips of today’s episode (10-18-12) of Dr. Phil, watching those teary adoptive parents show their anger, outrage and despair over losing their babies because of some (ridiculous) (unjust) Indian Child Welfare Act, I knew right away this was going to be a one-sided show touting the benefits of adoption, even if they had a few Indian experts on the show, too. Dr. Phil was obviously not allowing enough time to teach about ICWA and the wholesale removal of Indian Children in Canada and America, ethnic cleansing via non-Indian adoptions, or explaining why Indian children are called Stolen Generations. 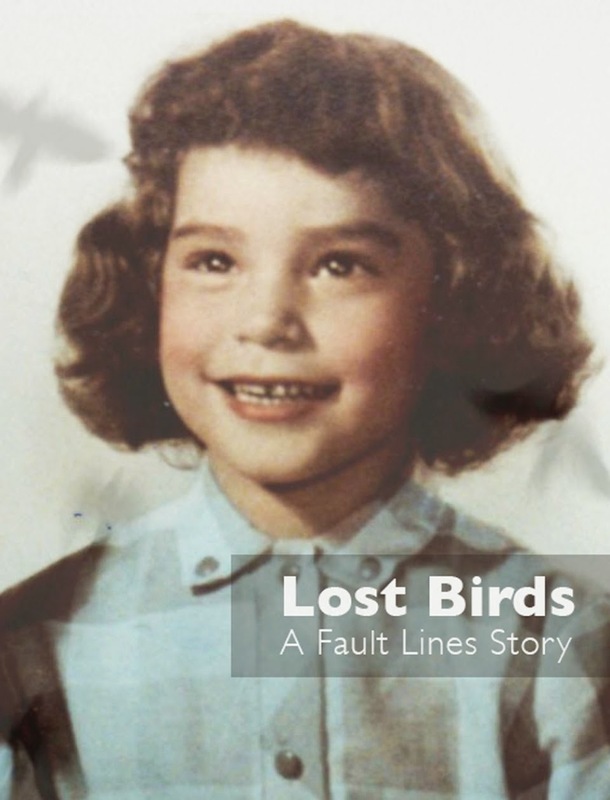 Until I wrote my memoir, I couldn’t find much information in one place and had to dig pretty deep. That’s another reason why I wrote two books hoping it will counter such ignorance and this Hollywood-ized adoption propaganda that still dominates TV. 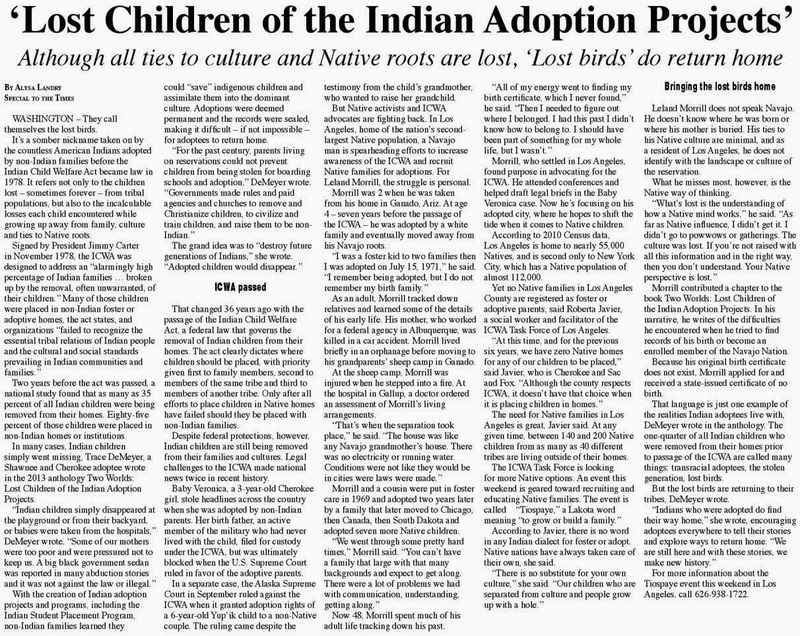 As I watched, it was obvious how young adoptees being Indian citizens didn’t really matter to the non-Indians parents who adopted them. All they really cared about is keeping them. If these Americans had any knowledge of the Indian Child Welfare Act, the testimony of Indian leaders in 1976, or the history of America’s neglect of Indians (poverty, starvation and concentration camps called Indian reservations), and the legal theft of thousands of children, maybe then we’d stand a chance going on TV or entering the public courts. 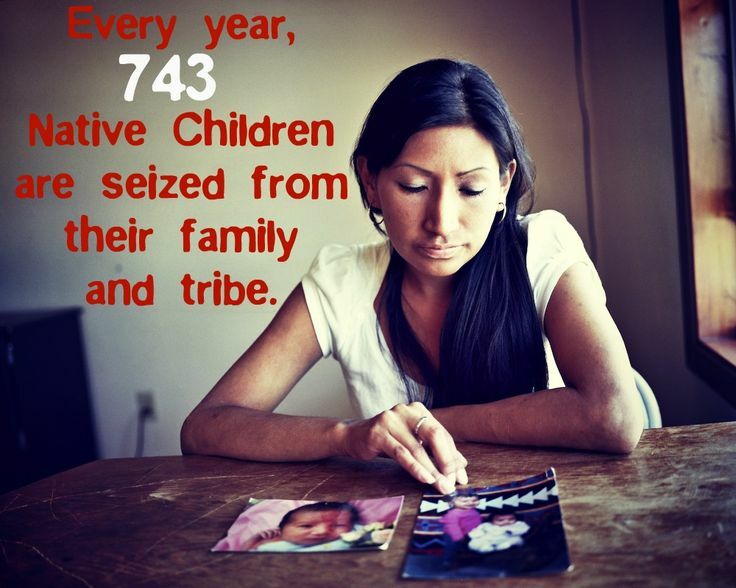 Maybe then America might catch a glimpse what 100+ years of theft of tribal children looks like. Facing down teary adoptive parents who expect praise, not condemnation, we Indians are very familiar with their race-based judgments. Indians went direct to the Senate to get ICWA. Indians won’t win any debates on public TV in three-minute segments. Our history on this topic alone could fill several library collections. Can you see how not telling prospective parents about ICWA is working out in 2012? Can you see how the lack of Indian history can fuel ignorance and inflame racism in America? 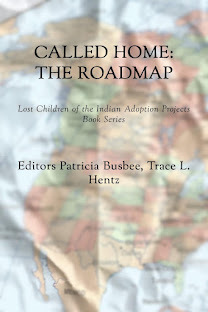 Can you see how adoption-propaganda still sells the public on how these nice white people only want to raise (and save) these poor little Indian kids? Doesn't anyone realize children do not choose to be taken from their natural parents and tribe? Oh - they also rolled out how some of these kids are part-Indians. There is no such thing as part-Indian. Which part, a foot? A finger? Blood is blood. That is the “racist construct” Indians hear all the time - blood this, blood that. It’s getting old…. Indian Children adopted as infants will not be able to explain the importance of blood, culture and connecting with their tribal relatives. As they grow up and see they are different in their white neighborhoods, and feel like they don’t belong there, then the truth will really matter. It will matter when the child meets other Indians and doesn’t know who he or she is or which tribe or clan. Knowing who you are matters. Ask anyone in my new anthology “Two Worlds.” Ask them how much they wanted to find their first families and tribes. Dr. Phil, are you ready to meet some adult American Indian adoptees? Trace, I wish I'd known about this episode. I've been to Phil & Robin's show many times at the studio on Gower. I even have a standing VIP invite. Oh well....perhaps one day while I'm visiting the show I will do that. I think his son Jay is the producer. Thank you Lele - let me know if you hear from their producers! While I'm white and ICWA doesn't affect me, I am familiar with the history and the need for the law. My thoughts are that some aspects of ICWA, such as notifications, the time with which one has to stop the process, the fact that signing off must be done in front of a judge....I think all Americans should be afforded these protections. Adoption is a corrupt industry. Why not keep it legal and all above board? 1. the bias was through the roof! 2. they couldn't even spell Miss Nimmo's name right! 3. this case didn't hinge on ICWA. the real issue was the birth mother did this to spite the birthfather. paperwork was never done properly and laws not followed. the father wasn't properly notified and there are repercussions for that. the Capobiancos would like to think that all this should be overlooked because they are good people and they desperately want this child! Liz, your comments are so appreciated. This show caused more harm than good. I think I spoke to Troy a few months back about this adoption. He may have been posting under an anonymous name or the person I spoke to was a puppet for Troy who speaks for him word for word. The person I spoke to is a big supporter of the Save Veronica page on FB. I did not get to see the whole show but clips. Everything Troy said word for word was said to me under an article about this adoption case a few months back. Bringing up 1% blood and he doesn't get that all colonial Mexicans are also AI. He uses that stereotype word Latino to bring up race issues. Explained to the person posting who may have been Troy that the 5 civilized tribes don't use blood %,the tribe would not discuss blood % or would it be a factor in this adoption. I asked him how he knew the child's blood % since the tribes don't give that info to the public and he ignored me knowing there was a gag order on the case. I told him the only factor in this case is that her direct ancestor took The Trial of Tears and was an accepted tribal member per the Dawes roll. Troy, Dr Phil and these adopters also do not understand the term Manifest Destiny and how this country was formed. When all said and done the tribes were not permitted to be citizens of the USA until 1924. 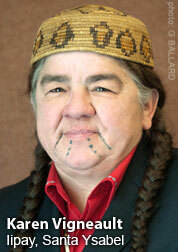 They still continued to steal tribal members into boarding schools, adoption, etc. Why ICWA was put into place same time the tribes fought for a freedom of religion act since they were not permitted to have freedom of religion until the 1970's. AI history should have been told because it does factor into this adoption. 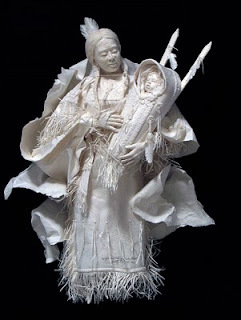 Leaving ICWA out, I agree the birthmother did this to spite the father. I saw tribal members posting that the father tried to get in touch with the mother but she broke off their engagement and took off. Father was serving in the military and got served with papers. He thought he was giving the mother custody. Custody and adoption are two different things. I know plenty of parents where one has custody and the other has visitation. Maybe he thought he was giving custody because at the time he was in military service. Someone posted when the father served with papers on a military base, when he realized he signed adoption papers not custody he asked for the papers back and the server refused. I am an adoptee and my mother too spited my father and gave me away to strangers because he did not want her. My father is dead and my father's family said they would have taken me. I as an adoptee am very unforgiving of what my mother did and I suspect Veronica will too when she is old enough to understand what her mother did to her father. If a woman "Willingly" gives her child away she is unfit to raise that child and unfit to make a decision in the child's well being if she thinks a child belongs with strangers instead of family and the child's father. Dr Phil thinks the mother had all rights to give the child away because she had custody. Wrong Dr Phil!!! Like this father, my father was not unfit. Like Ms. Nimmo stated it is better to have children placed with family than strangers. Like the judge stated both parents need to sign the adoption. In most adoptions in general father is never informed unless he is married to the mother. As for the Capobioncos was their attorney from OK or SC? Either way both states have Federal Indian tribes and their attorney should have known the Capobioncos were breaking the law and should have told them to give the child back immediately. I love how the Capobioncos call their situation a legal kidnapping by the bio father. This is absurd. They are the kidnappers and did it illegally. They also seem to think they own this child like many adopters. They took this child out of IT and brought her to a state where there are no Cherokee tribes. No one there to teach her her culture or language. I believe the Cherokee nations require all their tribal members learn their language. I know the Eastern Band do. If the Capabioncos cared about this child they would have never taken her out of IT and permitted her to be around her tribe. That's what good parents do give up themselves for their child's well being. This is all about them not the child and their ownership of a child that is not theirs. The Capobioncos are nothing but selfish, glad to see ICWA worked in this case and hopefully it stays that way.